Barkers Red Hots, Marietta GA (CLOSED) – Marie, Let's Eat! We learned a valuable lesson when we made our first visit to Barkers Red Hots about eighteen months ago: when a restaurant gets a glowing review and is featured in the pages of The Atlanta Journal-Constitution, wait a couple of weeks to swing by. That first trip to the venerable hot dog stand on Windy Hill saw us in a line an hour deep full of drooling weekenders savoring the smell of charcoal-cooked hot dogs. It wasn’t a wait I’d want to make regularly, but we were rewarded with some excellent dogs. Everything on Barkers’ menu is fairly terrific, and they feature quite a few sausage options along with their original red hots and jumbo all-beef dogs, all “grilled to perfection” over charcoal. Marie and I each prefer ours grilled pretty lightly, but if you’re among the large crowd who enjoys a nicely charred skin, they’ll gladly accommodate you here. They really are among the best in the metro area; until I discovered Brandi’s, they were my favorite, hands-down. Usually, I like their signature red hot, served with onions, pickles and their not-lethal spicy sauce. My son and Marie prefer their Italian sausages; our daughter likes a simple dog covered with melted cheese and some fries. It’s all the little extras that elevate Barkers into a place that everybody should visit. 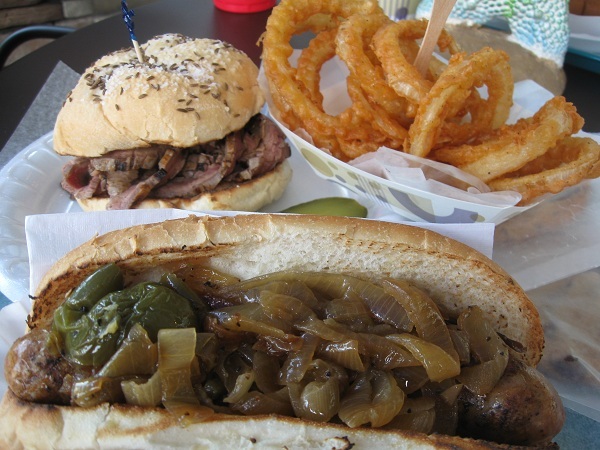 For starters, they serve what are arguably the best onion rings and the best French fries in the area. I particularly love the fries, which are precisely as vinegary and salty as I would wish them to be. They also offer an unexpected treat in a loganberry punch, which I’m pretty sure that nobody else in town sells. Add in the genuinely spectacular service of the staff, who are just about the best in the city, especially the fellow who’s often on the register and remembered my daughter’s name after just one visit, and you’ve got a restaurant worth many visits. For many years, Barkers was a must-visit cart in downtown Atlanta’s Woodruff Park, but the owner, Glenn Robins, sold the business in 1995 rather than continue dealing with the city’s labyrinthine rules and regulations for street vendors. Those owners had to change the name once they found a new meat supplier, and Robins returned to the business in 2007, taking back his old name and painting a storefront on Windy Hill in bright blues and greens. The location is just about a stone’s throw from what I thought you’d still call Smyrna, but it’s apparently in the Marietta 30062 ZIP code. It’s very convenient to enter from the interstate exit, but an absolute bear to get back. Unfortunately, shrinking summer hours have meant we weren’t able to get over there for a while. Our Saturdays were mostly booked and they’ve decided to close for dinner for the time being. This actually proved to be a real annoyance when Tom Maicon over at Atlanta Cuisine (recently relabeled Food & Beer Atlanta) raved about Barker’s beef on weck and I wanted to get over and try one, post haste. This had been one of those sandwiches that had always gone in one eye and out the other. Apparently a regional specialty from Buffalo, a good beef on weck should serve up some sliced roast beef or flank steak on a thick and chewy “Hummerweck” bun that is topped with sea salt and caraway seeds, and given a dense enough smear of horseradish on the bun’s heel to almost soak straight through it. I’m sure this is a pretty tasty enough treat in any competent grill cook’s hands, but over the charcoal at Barkers, it’s a can’t miss. We stopped there this past Saturday afternoon and while Marie and the girlchild enjoyed their usual hot dogs, I had the first of what I hope will be many beefs on weck. It’s a little pricy for a sandwich without a side when there are much less expensive dogs and sausages available, but I’m really keen to try one again with a smear of their signature red sauce. I bet that’s really good. And so getting one with rings and a loganberry punch will run me eleven bucks or so. I’ve been good; I can splurge every once in a while, right? Posted on September 2, 2010 July 29, 2017 by Grant G.Posted in atlanta, georgia, hot dogs, sandwichesTagged atlanta, georgia, hot dogs, marietta, sandwiches. Pingback: The General Muir, Atlanta GA – Marie, Let's Eat! Pingback: Fritti, Atlanta GA – Marie, Let's Eat! Pingback: Red Elephant Thai Cuisine, Marietta GA – Marie, Let's Eat! Barkers sadly closed in June 2017.